Dorm Co. Tip: Studying is why you are in college ... right? When you're studying you end up highlighting and writing things in the margins of your textbook or notebook. And then when you step back and look at what you did, you find you have more highlighted than not highlighted. When that happens, you need to mark what is really important with sticky flags. Our BookMarker Flag Pen Refills are a dorm essential for those times that you highlighted too much! 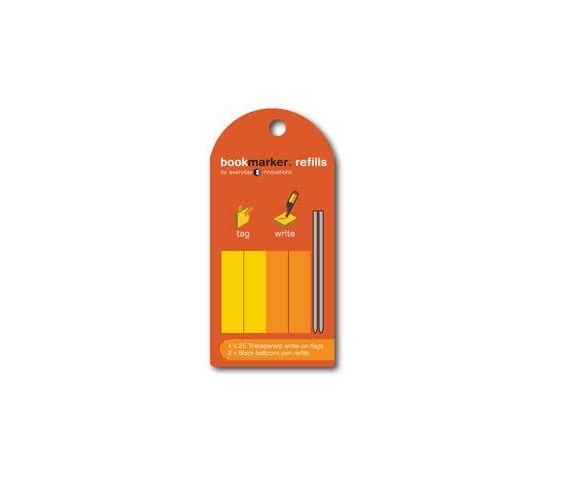 Our BookMarker Flag Pen Refills come with 100 transparent sticky flags. A benefit to these sticky flags is that not only will they point out what was really important, but you can also write on them to point out even more what is important! Don't study without sticky flags to bring your attention to items- just creasing the page corner will not work! Our BookMarker Flag Pen Refills also come with 2 ballpoint pen refills for the BookMarker Pen!